Summary: Chester the cat and Buddy the dog are always fighting. But one day Chester decides he's had enough and sets off on his own. Buddy can't believe it -- he actually misses Chester. With the help of some alley cats, Buddy decides to find his old friend and bring him back home. 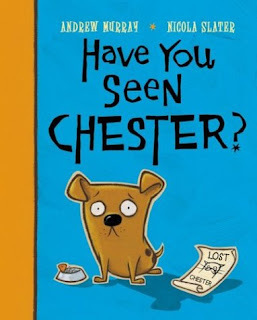 Our review: A timeless story and cool, bold illustrations are combined to make kids laugh and think in Have You Seen Chester? I purchased this book on sale and it has become my son's favorite bedtime story for over a year. Chester's a fluffy white cat who lives with Buddy the dog. Their owner, Lucy, is always trying to stop them from fighting. One day Chester finally has enough and leaves. But he doesn't tell anyone. When his absence is noted, Lucy looks all over the house for him. No cat. Life should be okay without a cat around to scratch and fight with. Right? A funny thing happens over time--Buddy begins to think about his small, furry cohabitant--the way he plays with yarn or cleans his face. Could it be he misses Chester? Lucy sure does. She cries and puts up flyers around the neighborhood. Buddy starts to believe he was the reason Chester left. That night he decides to go search for the cat. Walking around town he encounters a group of mean alley cats who surround him, ready to pounce. Until he mentions he's on a mission to find Chester. Instead of fighting the cats, who all know Chester, they decide to help reunite Chester with Lucy. I don't need to say more. This story has a happy ending. Have You Seen Chester? has blocky, colorful and funky pictures. The page where Lucy hugs Chester is touching. Slater's artwork conveys a sense of youth and fun which truly makes this story unforgettable. Murray's storytelling weaves a tale of two beloved pets who fight, much like siblings, and yet miss each other when separated. Since we own three cats and have a Black lab puppy in the house, my son sees for himself how cats and dogs interact. This is one thing he points out when we read this book. One of our favorite scenes is where the alley cats surround Buddy and he tells them who he's searching for. They then tell him, "Well, why didn't you say so?" and laugh. Murray captured the spirit of felines with his words and Slater paired them with fantastic pictures. Have You Seen Chester? is an ideal bedtime tradition for parents or caregivers to begin with that special boy or girl in their life. Cover comment: Simple and effective with big letters and a confused/mournful looking Buddy.